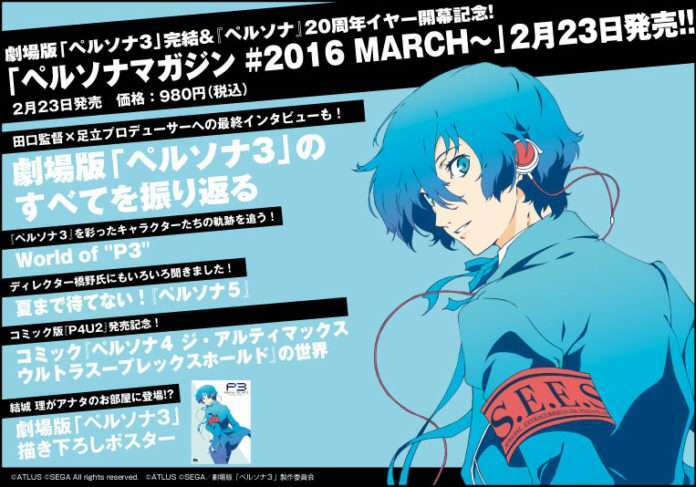 A preview of the upcoming Persona Magazine #2016 March issue on February 23 has been released via the official Persona Magazine website, showing off its contents. 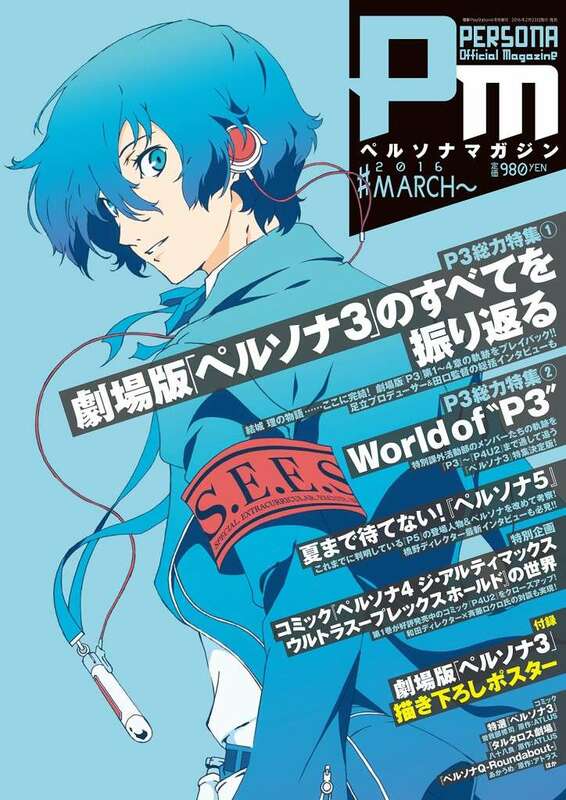 This follows the previously posted, updated content overview of what the magazine will contain, as well as the Persona 3 The Movie #4: Winter of Rebirth themed cover for the issue. 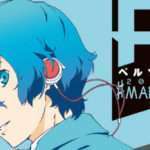 Since Chapter 1 was first released about three years ago, Chapter 4 of the movie version of Persona 3 has been finally released. 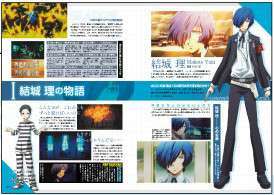 To commemorate the completion of the series, from Chapter 1 to Chapter 4, there will be a complete Persona 3 information roundup. The main characters from the film will be observed, including Makoto Yuki and those who accompanied him. 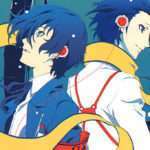 To celebrate the completion of the film version of Persona 3, the game version of Persona 3 will also be looked back on with the collective effort of the Persona Magazine editing team. 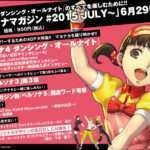 The members of the Specialized Extracurricular Execution Squad (S.E.E.S) will be examined in chronological order, from their start in Persona 3 to Persona 4 Arena Ultimax. Additionally, the residents of the Velvet Room and the Social Link characters from Persona 3 will also be covered, revisiting the charming world of “P3” in-depth. We can’t wait until its release; Persona 5 comes next. This will reintroduce the large-format illustrations of the characters and their Personas that have been announced so far. The initial Personas of each character that reflect their personalities are observed, and special attention will be given to the illustrations. The look back on this game will be delved into. Additionally, this will feature an interview with director Hashino. 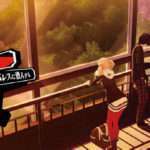 With fans eagerly awaiting the release of “P5”, it will have must-see content for the fans. The latest game in the Persona fighting game series is Persona 4: The Ultimax Ultra Suplex Hold. The first dynamically illustrated manga volume for this title has been released in January and, to commemorate it, there will be an interview with Wada—who served as the director—and Saito, the author of the manga. 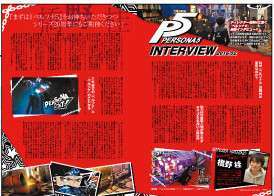 The interview will be four pages long, with a large format size of the manga’s opening for Persona Magazine. As announced previously, the upcoming issue of the magazine will include a B2 sized poster of the cover art for the #2016 March issue. 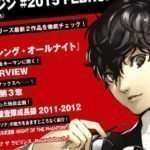 The previous issue of Persona Magazine was #2015 July on June 29, 2015, which featured Persona 4: Dancing All Night, Persona 3 The Movie #3, Persona 5, and Persona 3: The Weird Masquerade. 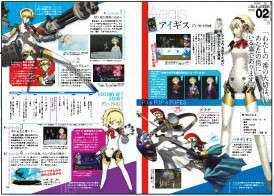 Persona Official Magazine is an ongoing, Atlus backed magazine about the goings on of the series that releases on an irregular schedule. It had an original run of 11 issues from 2011 to 2012, and it made its return on December 5, 2013 with its #Re:birth issue.